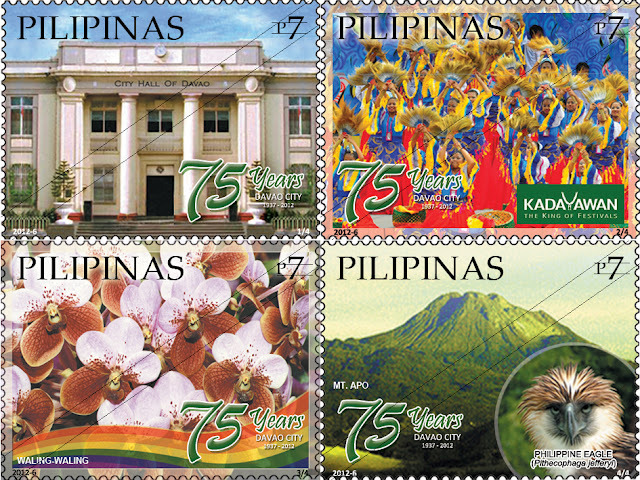 The Philippine Postal Corporation or Philpost issued on March 16, 2012 four commemorative stamps in line with, and commemoration of the 75th Foundation Anniversary of Davao City, as shown above. The Municipality of Davao became a city on October 16,1936 by virtue of Commonwealth Act No. 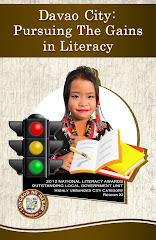 51 known as the Charter of the City of Davao as sponsored by the then Assemblyman Romualdo C. Quimpo. The City of Davao was inaugurated on March 1, 1937 with the Honorable Elpidio Quirino, then Secretary of the Interior, as President Manuel L. Quezon’s representative in the celebration of the inauguration. The stamps were designed by the Davao City 75th Anniversary Committee through its layout artist, Victorino Z. Serevo with Atty. Lyka Lopez and Jason Magnaye as design coordinators. The City Hall of Davao (formerly the Municipal Building) was constructed in 1926, some ten years before Davao finally became a city. It is located along San Pedro Street, one of the oldest streets in Davao City. Over the years, Davao has become an ethnic melting pot as it continues to draw migrants from all over the country, lured by the impressive economic progress in the country’s third largest city. Today, Davao City is the most progressive city in Mindanao and is considered the most livable city in the country. August is a merry month in Davao City, because it is on this month that Dabawenyos celebrate a thanksgiving for the year's blessings of bountiful harvest of flowers, fruits and other agricultural produce, and honor the city's richness and diversity of artistic, cultural and historical heritage in a grand annual celebration called Kadayawan Festival. The festival is celebrated every 3rd Week of August. Waling-Waling (vanda sanderana) grows in natural abundance in Davao City particularly at the foot of Mount Apo, the Philippines' Highest Peak. Davao's typhoon-free weather all year round with practically no pronounced wet or dry season, and a uniform distribution of rainfall, temperature, humidity, and air pressure, make it conducive to growing rare exotic orchids and plants. Moreover, the City has more than1,000 square kilometers of lush tropical forest, or about 47% of its total land area with rich volcanic soil that allows rare plants to thrive and flourish freely. All these qualities contributed to the eventual declaration of Davao City as the official “Orchid Capital of the Philippines”, as declared by then President Corazon Aquino. The magnificent Mount Apo is hailed as the "King of Philippine Peaks", the country's highest mountain peak with an elevation of 10,311 feet or 3,144 meters above sea level. It is also one of Southeast Asia’s highest mountains, and much sought after climbing destinations. It is also home to the King of the Philippine Skies, the Philippine Eagle (Pithecophaga jefferyi). Mount Apo, majestically towering over the vast expanse of the southern tip of Mindanao island, and bordering over the mountainous edges of Davao City, provides a breathtaking view of various volcanic formations, craggy rockscapes, and the rich virgin forest lands of Davao City, Davao del Sur and North Cotabato. It is a flat-topped mountain with three peaks, and is capped by a 500-meter wide (1,600 feet) volcanic crater containing a small crater lake. Its base covers about 72,796 hectares of mountain ranges that extend from Davao City, Davao del Sur, Northern Cotabato, Bukidnon, and Agusan del Sur, to Misamis Oriental. Its peak overlooks Davao City 40 kilometers (25 miles) to the northeast, Digos City 25 kilometers (16 miles) to the southeast, and Kidapawan City 20 kilometers (12 miles) to the west. The success of a city largely depends on its strong leadership and the people who support it: the rules and regulations are strictly enforced and religiously complied by all; peace and order are maintained; goals and visions are attained; and the progress it accomplished is sustained. 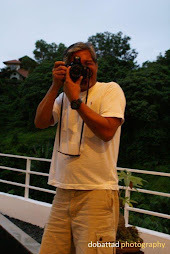 The unique wonders of nature of Davao City, the benevolence of its leadership, and the remarkable discipline and warmth of Dabawenyos, all of which account much to the success that the people of the Davao and the city itself enjoy. It makes sense why Davao City has ultimately become a premier city and will remain high on the list of the top tourist destinations in the Asia Pacific region.